Alan Yates' Laboratory - Comments for "More Beacon Work"
Comments for "More Beacon Work"
I moved it 2.3 kHz for you, not 500 Hz. It doesn't run 24/7, it runs when I am home, and occasionally when I've taken a radio out to measure its signal at a distance. Night happens to be the best time to operate it, I let it run while I'm asleep and see what reports I get in the morning. I announced it on QRP-L the other day, so I figured I'd run it for the weekend while I'm here and see what reports I get, then I'll probably be done with it for a while. It's an experiment mate, it isn't going to be there forever. I listened to the frequency before I powered it up; heard nothing. Basically I was there first. The TX is spectrally pure and relatively click free. If you can hear it for 3 kHz then your receiver could use better filtering. There is plenty of spectrum around your rock frequency to place your call in. If I was running 100 watts or something I could understand your distress, but I'm putting out less than 1.5, and most of that is just heating up my balcony railing. Heck you've probably got more ERP with your 250 mW into a decent antenna. You could try another rock frequency like 3.6864 MHz. My offer still stands for ceramic resonators too... Tell you what, I found your postal address on QRZ.com, I'll drop a few different rocks and resonators in the mail for you on Monday if you like. Is there a reason your beacon has to run 24 hours a day 7 days a week, I didn't think that was allowed on 80 meters. I relise you shifted your beacon half a kc but you can still hear it from 3.578 to 3.581 and anybody that would be scanning that frequency would just assume it is still just your beacon after all this time and just continue past. The Pierce oscillator configuration doesn't lend itself to being used as a VXO very well, I'd have to rebuild the oscillator as a Colpitts. If I did that I may as well use the resonator and build a buffer stage to eliminate the chirp. The nice thing about the Pierce oscillator is that its output is large enough to directly drive the output stage, but it places tight demands on the xtal quality. The rocks I have are also very high Q and extremely hard to pull, even when doubled up and an inductor used, I tried this last night. I'll see if I can get a PAL N crystal ~3.582 or carefully dismantle one of the colourbursts I have and alter its frequency a bit. Nice little rig mate! Is that a Pixie? BTW: Is the new beacon frequency outside your passband now? One thing that bugs me about the pixie is its lack of AF filtering, if I built one permanently I'd probably add an AF bandpass filter. Have you thought about paralleling 2x 3.579 xtals. this will allow you to pull the frequency down and tune between 3.545 and 3.565. Here is a link to some info about it. I would have done it in my little rig but I don't have room, HI HI. Here are a couple pice of the little 250mW transceiver I built last week. I've moved the beacon TX frequency up to 3.5810 MHz. I replaced the xtal with a ceramic resonator but it was too chirpy for my liking, so I put back the xtal and put a 65 pF trimmer in series with it. This gave me a sufficiently stable oscillator, but reduced the drive and about halved the output power. To restore the output I put a 330 k resistor to the +ve rail at the FET drains where the 39k currently just grounds them, this biases gates on a bit and lets the output of the Pierce oscillator swing them into saturation. Hopefully this 2.3 kHz offset from the previous frequency will give you some breathing space. For CW that is a *huge* gap, so I am sure it will. Sorry if I am QRMing you. As I've said before to Paul I am mindful of this. I picked the colourburst frequency as I had many xtals for it in the junkbox. I dunno about 10 days mate, the beacon has only been running on and off (MEPT style) for the last five into the new antenna, and was down for days before that. You might like to try 2N3053 or BD139 instead of paralleling up 2N2222s. The 2N7000 seems to work well and has less drive requirements than the IRF510 if you only want a few hundred mW to a W or so. Sorry if I came across as rude, I didn't mean to. The last thing I wish to do is discourage a fellow homebrewer, it seems there are so few of us around. I love the transmitter, throw a key on it and lets have a QSO. This weekend I want to play with the idea of Paralleling 4 2N2222A's together and trying to punch out 2 watts without letting the smoke out. Once again, I apologise for being rude in my earlier post. Hi Alan, name here is Charley , VK2ZYZ, QTH is Wauchope,NSW. I hear your beacon loud and clear, well actually RST 459. The problem is I have been hearing it 24 hours a day for more than 10 days, and as I use this frequency for QRP as well I would really appreciate it if you could turn your beacon off to allow me and other QRPers to actually call CQ from our own QRP stations on this frequency. As I am only 250mW of power, you are stomping ontop of me. I am very interested in the schematic for your beacon and the antenna work you have done, very impressive work. Please accept my appoligies if I have come off as rude, as I am just requesting that you share the frequency a bit as I would love to be able to test some of my equipment as well. Thanks very much for the fine report! I only put the beacon back on the air tonight after finishing a matching network for its new antenna. I'll be writing that all up shortly. My apologies if I am QRMing a scheduled QSO. I am mindful that I am kinda hogging the colour-burst frequency for hours on end when I fire this thing up. I should really replace the xtal with a ceramic resonator and pull it off a bit from this defacto-QRP calling frequency. 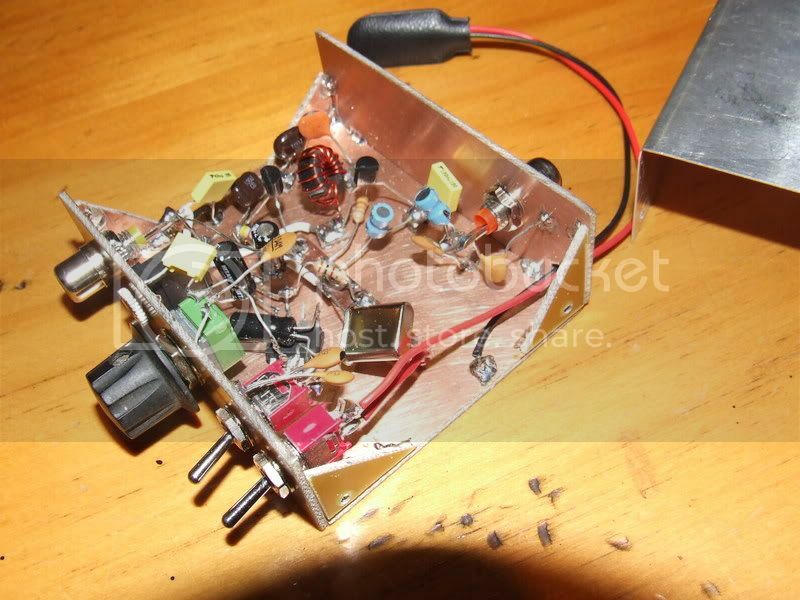 The beacon transmitter is very simple and would make a fine QRP CW transmitter. Paired up with a simple direct conversion receiver you'd have a usable little homebrew rig. I've just bread-boarded an extremely simple receiver (3 transistors) for monitoring the beacon TX while it is operating, with a bit of fiddling to make it more sensitive it might complete a transceiver. Heard your beacon Alan 13.7.08, 7:30 UTC, RST 5/5/9 from Wauchope NSW. Grid QF68IN. I am just getting into home brew QRP rigs and hearing a small home brew TX like that is real motivation. I came across the beacon looking for QRPers on the colour burst frequency. 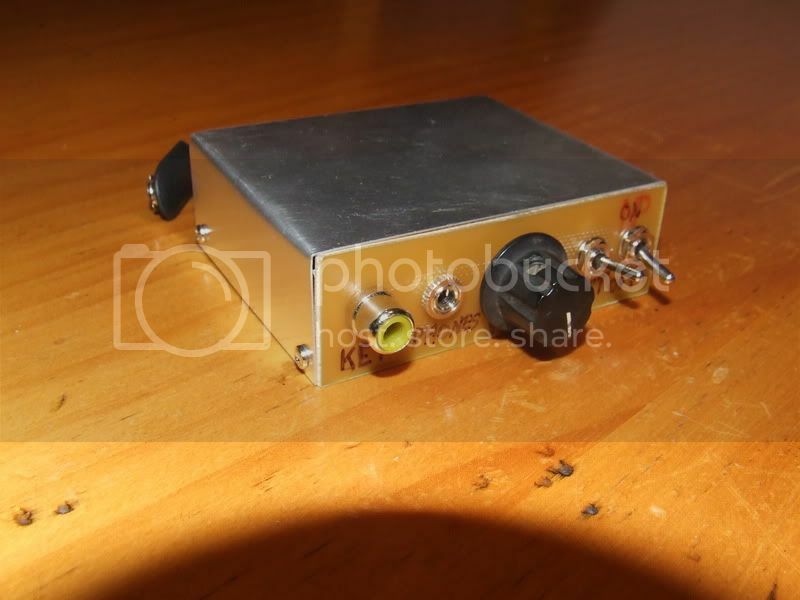 I have a friend who has already built a small QRP transceiver and thought he may be there calling CQ. Yeah I love your callsign, you must have been lucky to get that one? I'd imagine it has a history of Morse fanatics behind it. Can you tell me more about the receiver you were using? I'm a big fan of Drew and Peter's designs too. They are both far better at the metal-bashing side of things that I, and make very nice looking stuff. I heard your beacon at 4am while lying in bed with an earphone connected to a homebrew receiver. I am a bit of a Morse nut particularly QRP CW. I'm no technician but have a shack full of my "creations" mostly made from kits or designs by VK3XU or VK3YE. After I read your call sign and url, I tried QRZ.com and have just finished looking at your site - most impressive. Did you just stumble across it, or did you read about it on this website and then go listening for it? Hi Alan, heard your 80m beacon 4am 3July 08 in Newcastle. RST 559.